In a nod to National Jerky Day, Jack Link's has crafted the greatest bit of Americana not featuring an eagle or tallboy. 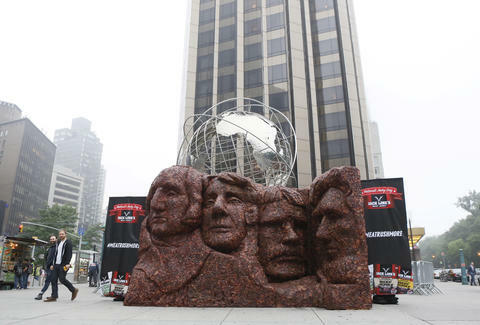 "Meat Rushmore" is a 12ft-tall, 20ft-wide replica of South Dakota's only claim to fame made out of over 1,600lbs of Jack Link's beef, pork, and turkey jerky. It took up residence in New York's Columbus Circle for one day only, and obviously inspired a whole lot of selfies. Teddy is no doubt shedding a single, salty tear in heaven's hunting lodge as we speak. Kristin Hunt is a food/drink staff writer for Thrillist, and can never decide if TR or Andrew Jackson would win in a duel. Follow her to presidential puzzles at @kristin_hunt.